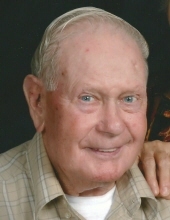 Kenneth E. “Stub” Kephart, 89, passed away peacefully on Friday, February 8, 2019, at his home in Riceville, IA, after a brave battle with cancer. He will be remembered as a caring, loving, selfless, hardworking man. Those who knew him enjoyed his infectious smile and admired his amazing memory of dates and activities of the past.He is survived by his wife, Darlene (Kruger); his children, Doug Kephart of Dassel, MN, Lori (Ralph) Elliott of Grinnell, IA, and Steve (Lisa) Kephart of Mechanicsville, VA; three sisters, Helen Krumwiede of Costa Mesa, CA, Bonnie Holtz of San Clemente, CA, and Shirley Saraga of Kingman, AZ; his brother, Keith of Seal Beach, CA; seven grandchildren; and five great grandchildren. To send flowers or a remembrance gift to the family of Kenneth Kephart, please visit our Tribute Store. "Email Address" would like to share the life celebration of Kenneth Kephart. Click on the "link" to go to share a favorite memory or leave a condolence message for the family.